Leaving the EU would not help the UK steel industry and if Tata decides to remain in the UK it will need to do a lot of rebuilding with its staff, according to local MP, John Healey. The decision by Indian-owned steelmaker to explore all options for portfolio restructuring including the potential sale of Tata Steel UK, in whole or in parts, has led to much debate over the future of the steel industry. IMechE, the independent engineering society working to raise the profile of mechanical engineering, hosted a debate on the issues in Sheffield this week bringing together industry players, politicians, lobby groups and chambers of commerce. The panel discussed the competitiveness of UK steel in comparison other nations such as Germany. Whilst European producers had all been hit by Chinese dumping, it was concluded that the UK is being further impacted by the lack of a long term industrial strategy and uncompetitive business rates and energy costs. Andrew Douglass, engineering director from TATA Speciality Steels in South Yorkshire, explained that on the 600,000 tonnes produced via the Electric Arc Furnace (EAF) at Aldwarke in Rotherham, the company loses an estimated €40 per tonne due to energy costs and tariffs - that's on specialist steel that sells for €600 per tonne. He also explained that energy and infrastructure could affect the future of the industry and the "green steel" method discussed by potential buyer, Liberty Steel, adding: "The UK exports some nine million tonnes of scrap but we have a barrier to using it through the EAF route. Whilst it is technically possible to build a new EAF, the infrastructure needed will cost the same again. Connecting to the grid, with the huge amount of power needed in seconds, means it is not liked by energy providers who can't ramp up generation as fast." Douglass was positive for the future of speciality steels in South Yorkshire - a £275m of turnover business, specialising in carbon, alloy and stainless steels for demanding applications like aerospace, motorsports and oil and gas. Until recently it employed over 2,000 people. Douglass said: "The future is around vertical integration and specialisation. The blast furnace at Port Talbot has been turned around since the much publicised £1m a day losses and is now comparable to IJmuiden [Tata's Dutch plant], but it doesn't have the capacity to galvanise the steel it produces, which is where the added value is. "Speciality is an example of vertical integration using the EAF route. The strategic focus on sectors such as aerospace means that the margins are much better on refining the steel than producing it. "It's been a privilege to work with an ambitious company and Tata have invested heavily. Where do we want to be? It's a big opportunity and I'm optimistic of the challenge." Wentworth and Dearne MP John Healey, whose constituency includes the Aldwarke plant congratulated the IMechE on securing the debate in South Yorkshire, "as the crisis goes beyond Port Talbot. Rotherham is the forgotten town." The MP told that debate that all parties agree that the UK needs a steel industry and added: "We have seen intense pressure in the last year. I think David Cameron doesn't want to see the end of the UK steel industry whilst he is Prime Minister." Healey was critical of the Government's action so far with changes to tariffs that could have been brought in much sooner and no changes to a business rates system that is seen to punish investment. He also continues to raise concerns over Tata's sale process, stating: "The sale of Long Products to Greybull took two years. The current tight timescales are too short and I don't want to see the future of the operations jeopardised by haste." There has been conjecture that Tata may even stay in the UK and keep some of its assets, especially as the Government examines pension liabilities and offers financial support. On this Healey said: "Having talked for years with members of staff, if Tata stays, there will be a lot of rebuilding needed with the workforce." The final point of the debate saw the panel conclude that leaving the EU would not help the UK steel industry. Andy Tuscher, regional director of membership organisation, EEF, which lobbies the Government on steel and other engineering sectors said: "A third of UK steel is exported to the EU and two thirds of steel imported is from the EU. Leaving would create even more uncertaintity on top of the issues that we already face." John Healey added: "The EU is the single biggest market. To think that Britain on it's own could negotiate a trade deal with China on favourable terms is for the birds. They wouldn't even have us in the room." Indeed, Tata Steel employees have been sent a memo ahead of next week's referendum stressing how important the EU market is. It reads: "access to that market is fundamental to our business." 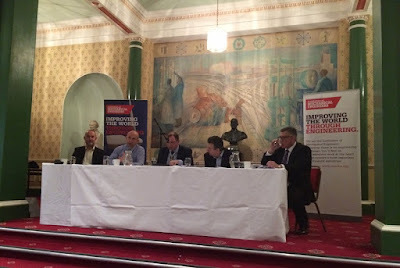 The panel was chaired by Master Cutler Craig McKay and featured panelists John Healey MP for Wentworth and Dearne, Andrew Douglass, engineering director from TATA Speciality Steels, Andy Tuscher, regional director, EEF and Andrew Denniff, chief executive of Barnsley & Rotherham Chamber of Commerce.